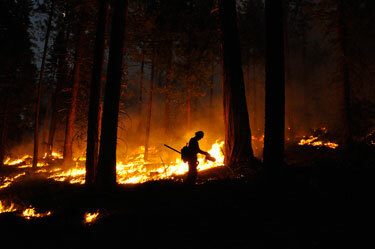 A forestry technician tends a prescribed fire at night on the Stanislaus-Tuolumne Experimental Forest. Prescribed fire is part of the treatments conducted in research to examine forest restoration techniques. U.S. Forest Service photo by Eric Knapp. Fire exclusion (largely a result of fire suppression, but also the elimination of tribal burning), past and ongoing harvesting practices, and livestock grazing have changed forest structure and species composition in many western U.S. coniferous forests. The effects of these activities have been most pronounced in seasonally dry, low- and mid-elevation coniferous forests that once experienced regimes of frequent, low- to moderate-intensity fire. Altered fire regimes have increased the density of trees (stand density), made stands more structurally homogeneous, decreased overall tree size, and increased surface fuel loads for many forests of this type. These changes concern fire managers because many forests are now vulnerable to more severe fire than we observed previously. Changing climates in the next several decades may further complicate fire management by increasing temperatures and fire season length. Currently over 10 million hectares (nearly 25 million acres) of coniferous forests in the western United States face moderate or high fire hazards, posing a significant problem for management. Because of these hazardous conditions, current management strategies often focus on modifying potential fire behavior. Several recent fire policies and initiatives, such as the U.S. National Fire Plan, National Cohesive Wildland Fire Management Strategy, and Healthy Forest Restoration Act guide fire management across the nation. Forest managers seek to modify fire behavior by reducing fuels through thinning or prescribed burning. More research is needed to understand the extent to which mechanical thinning might mimic natural ecological processes as well as the precise effects of these fuel reduction practices on potential wildfire severity under different fire weather scenarios and forest stand conditions. Creating forest structures that can reduce fire severity across a large landscape may decrease the need for aggressive firefighting strategies and could eventually reduce the costs of wildfire suppression. The efficacy of treatments that alter vegetation structure and fuel loads to modify fire behavior is still not well understood at local, state, and national levels. Recent research shows that treatments, including both mechanical thinning and wider-use of prescribed fire, are needed to reduce the density of trees and fuels in many of today’s forests. Scientific findings consistently reveal that low-intensity, frequent fire is a keystone process in these forests, so the best mechanical treatments appear to be those that mimic the conditions resulting from these fires. Prescribed fire or managed wildfire, aimed at creating/restoring the inherent patchy landscape that historically occurred in drier coniferous forests might be used to fully restore forest resilience. Knapp E.E. ; Skinner, C.N. ; North, M.P. ; Estes, B.L. 2013. Long-term overstory and understory change following logging and fire exclusion in a Sierra Nevada mixed-conifer forest. Forest Ecology and Management. 310: 903-914. Kilgore, B.M. 1973. The ecological role of fire in Sierran conifer forests: its application to national park management. Quaternary Research. 3: 496–513. Lydersen, J.M. ; North, M.P. ; Knapp, E.E. ; Collins, B.M. 2013. Quantifying spatial patterns of tree groups and gaps in mixed-conifer forests: reference conditions and long-term changes following fire suppression and logging. Forest Ecology and Management. 304: 370-382. North, Malcolm, ed. 2012. Managing Sierra Nevada forests. Gen. Tech. Rep. PSW-GTR-237. Albany, CA: U.S. Department of Agriculture, Forest Service, Pacific Southwest Research Station. 184 p.
North, M.; Stine, P.; O'Hara, K.; Zielinski, W.; Stephens, S. 2009. An ecosystem management strategy for Sierran mixed-conifer forests. Gen. Tech. Rep. PSW-GTR-220. Albany, CA: U.S. Department of Agriculture, Forest Service, Pacific Southwest Research Station. 49 p.
Parsons, D.J. ; DeBennedetti, S.H. 1979. Impact of fire suppression on a mixed conifer forest. Forest Ecology and Management. 2: 21–33. Scholl, A.E. ; Taylor, A.H. 2010. Fire regimes, forest change, and self-organization in an old-growth mixed-conifer forest, Yosemite National Park, USA. Ecological Applications. 20: 362–380.